mind the gap: HBR: What Is The Work Of The CEO? 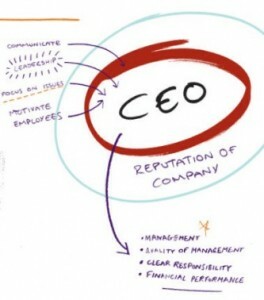 HBR: What Is The Work Of The CEO? "The CEO is the link between the Inside that is 'the organization,' and the Outside of society, economy, technology, markets, and customers. Inside there are only costs. Results are only on the outside." -- Peter Drucker, "The American CEO"
Alan ("A.G.") Lafley TOOK OVER AS CEO of Procter & Gamble in June 2000 when the FMCG behemoth was battling turbulent times. At 6pm on his first day at the office as the new (and first time) CEO he was facing a hostile press conference live on national television – like a "deer in the headlights" as he recalls. P&G stock price that had crashed from $86 to $60 in one day tanking Dow index by 374 points, went further down by 11% at the news of Lafely's appointment as the new chief. The headlines went from "P&G Investor Confidence Shot" to "We love their products, But we hate their stocks." to "Does P&G Still Matter?" Four years into working hard at trying to turn the tide and leading P&G as the chief executive, one day out of the blue, A.G. decided to give a call to Peter Drucker at his residence. Drucker, 83 at that time, answered the calls himself, and apparently invited A.G. to come over for a chat. In October 2004, A.G. and a groups of executives spent quality hours discussing the leadership challenge with Peter Drucker at his residence. Drucker made numerous side notes during the meetings, and others made notes of Drucker's advisory quotes and observations. In 2009, before retiring after 10 years as the CEO of P&G, A.G. compiled an HBR article and published a very interesting case study on how he turned around P&G's fortunes to make it one of world's largest consumer goods manufacturer. On the larger part, A.G. credits Drucker for his strategy and success. Determine which external constituency matters most. Your company has many stakeholders, each with important demands. Once you’ve defined your most important external constituency, ensure that everyone acts on that understanding. "Equally important—and also a task only the CEO can fulfill—is to decide, What is our business? What should it be? What is not our business? And what should it not be?" For example, what are your core businesses, and which of them will you grow? Analyze the attractiveness of the businesses you’re already in, your company’s position in existing industries relative to competitors’, and industries’ strategic fit with your core competencies. "The CEO decides on the balance between yield from the present activities, and investment in an unknown, unknowable and highly uncertain future... it is a judgment rather than [a decision] based on 'facts.'" Adding that, "Effective CEOs make sure that the performing people are allocated to opportunities rather than only to 'problems.' And they make sure that people are placed where their strengths can become effective." Ensure that stakeholders’ near-term interests don’t overshadow your company’s long-term future. Balance short-term investments with investments in resources needed for your company’s longer-term future. "CEOs set the values, the standards, the ethics of an organization. They either lead or they mislead." Go here for A.G. Lafley's HRB article: "What Only the CEO Can Do"